Hey everyone, today is going to be quick post showing my outfit combinations. The two outfits I will show are perfect summer/spring outfits can be paired with a jacket for slightly colder regions. To start with heres a simple black and white combination. 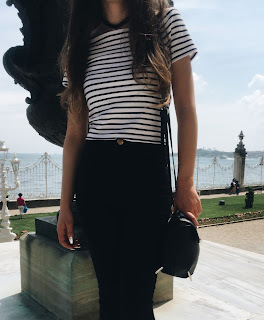 Im wearing a striped cropped top from Stradivarius paired with high waisted skinny jeans from H&M. As accessories I have my little side bag from Rubi and my sandals are from Kmart. This is a very monochromic look which are my favourite. The next outfit is jeans and blouse outfit. Im wearing a short sleeved white blouse from Mango with my black skinny jeans from Stradivarius. My bag is from Defacto and my shoes are from Kmart. The idea was to add some colour to a basic outfit with my bag and shoes. Hope these outfit ideas are helpful. Make sure to tag me on Instagram with your outfit ideas.